In Khan Wars players take on the role as a ruler of their own Castle and surrounding territory that they must watch over, protect and advance to create a powerful army and lay siege to other enemy castles to plunder resources and claim territory. The game is a tactical strategy based MMO where players can engage in PVP combat as solo attackers or work together with other players and form Clans to take down other large rival organisations. As the game can be played in your preferred Internet browser is no need for a client download, as well is this Khan Wars can be played for free. Khan Wars is a mediaeval strategy MMO that focuses primarily on PVP combat with players from all around the world, managing both time and resources players must focus on establishing a working city/Castle and constructing various buildings to help create and support their army. The entire game revolves around Rounds that will refresh regularly to allow new players the chance to work their way up the Rankings as they compete against other players. 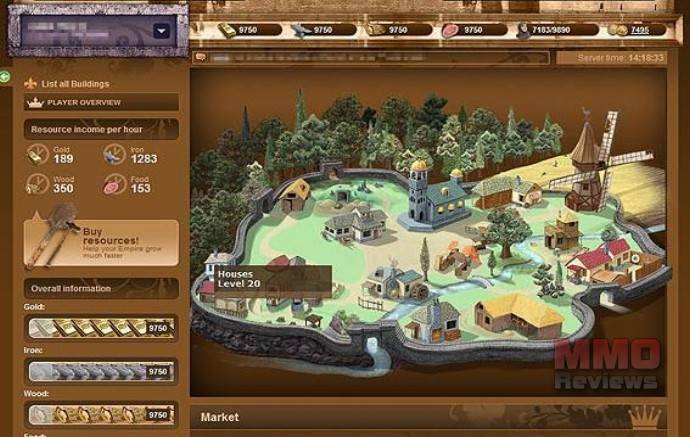 Players can construct and upgrade other types of buildings, for example the Wall is essential for establishing strong defences, the Marketplace allows players to buy and sell resources with each other and the Infirmary lets players heal up those troops that have been wounded and lost in battle. Each building has a rank attributed to it, starting out the rank one, players can continue to upgrade their building to gain more resources or benefits from it and overall making it more efficient. Many buildings have prerequisites that players must meet by constructing other buildings and upgrading them to a certain rank before construction of the new, more advanced building can begin. The main focus in the game has is PVP combat, all elements of resource acquisition and trading between players leads towards training and fielding a strong army in which to defend your Castle and attack other players’. A typical battle has an Attacking player that will lay siege to a target Castle and a Defending player trying to fend off the invasion. Combat is completely automated with the unit types attacking in a specific order of a series of 12 rounds, where each unit will have the chance to make a single attack. If the Attacker is successful in their assault and kills all the enemy troops then they will steal a portion of their opponents’ resources, if the Defender is successful then no resources are gained, similarly if the Attacker has not claimed victory within the 12 rounds and a draw is call. Players can compete against each other to gain rank on the leaderboards by completing a variety of tasks, either earning the most XP to top the Player Ranking, or compete in the Weekly Ranking to see who got the most kills from attacking, the most kills from defending, managed to steal the most resources or spent the most resources constructing buildings. this game logs you out continuously to save on bandwith, they blame it on bot protection but its not its a bandwith saver other games don’t log you out every hour, its really aggravating to play. especialy on phone it takes 30 minutes to log back in as they give you little circle you have to get inside of. Untill they fix that I wouldn’t waiste your time playing it. It logs you out so often you can not even keep your building que full without never leaving the computer. Good game crappy web developer. more people quit within 24 hours than play by a far amount.